Attic conversions allow homeowners to build up rather than out for a renovation that maximizes space. This complete attic conversion guide can help you have a beautiful new space in your home without the cost of an exterior addition. If you’re looking to convert your attic, check your local building code to make sure your attic qualifies. Some specifications will change depending on your local municipality. If you don’t meet the code requirements right now, don’t worry! There are projects that you can build into your renovation to meet building code which qualifies your attic for conversion into a living space. The first is your ceiling height. To be classified as a livable space, your floor to ceiling height will have to be at least 7 feet. If your attic is shorter than this, you can lower the ceiling on the lower level or raise your roof. This may seem like a daunting task, but it can be done with the help of a contractor. If you’re looking at converting your attic, you’ve probably already thought about the second code requirement: heating and cooling. Building code requires that your attic can maintain a temperature of 68°F. This is normally not a problem between your current heating and cooling system and attic insulation. Much like any other home renovation, most of your costs will depend on the size of your attic. Porch.com also suggests investing a proportionate amount to your home’s current value, saying it should be no more than 15%. For instance, if your home is valued at $150,000, you won't want to spend above 15% of that or $22,500. The average attic conversion cost has a wide range of $25,000 to $50,000. This will depend on your attic's space and your location. If your attic is already code friendly, not as much renovation will be needed. This means a smaller renovation budget is possible. In order to set a conversion budget and stick to it, make a comprehensive list of all changes and updates you want to make to your space. Your contractor can then tell you up front the estimate. Be sure to put money aside for any furniture you will be buying for the space as well. You don’t want to have a beautifully finished space with nothing in it! Complete your attic conversion with a beautiful staircase to reach your space. With 3 indoor product lines, Salter has a spiral staircase to fit every budget and home design style. A benefit to any home renovation is that it will increase the value of your home. The 2015 national average for the return on investment of an attic conversion was 61%. If you spent $20,000 on your renovation, you can expect $12,200 to be added to your home's resale value. It's a great way to add to the home’s living space without the complexity that comes with an addition. Because your attic already has a structure in place with a floor and roof, it is overall cheaper than a brand new addition. This is also a great option for those who live in developments where homes are close together or townhomes. In these situations, expanding out isn’t an option. By building up, you are able to add to your living space and therefore the value of your home. If you’re looking to earn some extra income, consider renting out your newly converted attic. This home renovation is perfect for those who are looking to rent out a room in their home or for landlords looking for a larger return on their rental properties. If it’s in your personal residence, a bedroom with an en suite bathroom is the way to go. You can give your renter their own space. Whether it’s in your personal home or a rental property, you will need to meet code if you plan to rent out the room. Refer to your local building code to ensure that your space is safe and ready for tenants! 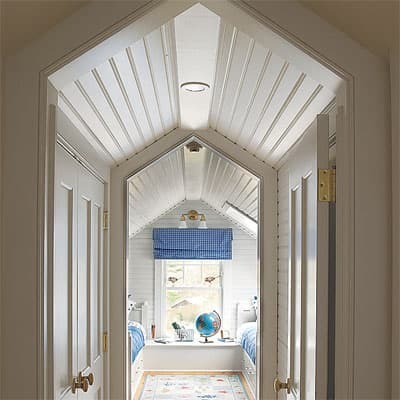 Your converted attic’s ceiling will be a focal point for anyone entering the room. The sloped ceiling is an interesting and unique piece of architecture for your new room. Make the most of it by finishing it in a way that will compliment your room’s design. If you want a traditional room, creating paneling from strategically placed molding is one way to add elegance to your space. It’s a classic finishing touch that looks polished. If you want a room with country charm, beadboard paneling can easily be installed. Beadboard is similar to drywall in weight, but the decorative grooves give a more finished look. A popular decorative ceiling finish is wood paneling. This is the most versatile of the three materials listed here. Because of the different species of wood and the ability to stain them, you can keep the warm and rustic look of your wood panels while still finishing them to ensure longevity. With the ceilings being a main design feature, your walls become a supporting feature. Most attics have knee walls, which are short walls usually under 3 feet. When you have these small spaces, you have to maximize your walls with built in storage and seating. Install recessed shelves in the oddly shaped spaces to create storage in a wall that you wouldn’t previously have been able to use. If you want a closed storage space, drawers and cabinets are great options in these same spots. Consider built in seating as well. By keeping them against the short walls, you can open up the center of your space for bigger pieces of furniture. When considering your flooring options for your new attic, think about it in relations to the other areas of your home. Many times, people want to keep the excess sounds of upstairs traffic to a minimum. This makes carpet an obvious choice. It absorbs excess sound making it the perfect flooring option for attic conversions that will be heavily used. If you want to use hardwood flooring in your attic, bulkier floor joists and dense insulation can help to absorb noise that would otherwise travel through the floor. When renovating your attic, windows and natural light are a huge consideration. By allowing a lot of natural light into the room, it not only looks bigger, but it’s also a more enjoyable space. There are two windows that are most common in attics: dormer windows and skylights. Dormer windows are windows that are built to project vertically from a sloped roof, making them ideal for attics. They allow a lot of natural light to come into the space. Because the window projects out, it also creates space in your attic. This nook is perfect for built in seating and storage. Skylights are the other common option for natural light in an attic conversion. These are often built into your home’s design. If you don’t have excess natural light built into your home design, you can include skylights without altering too much of your original roofline. While a dormer window requires its own vertical wall, a skylight can be easily fit into the existing slope. Depending upon your previous means of access, you may need to replace your attic stairs. Many attics feature a folding staircase, or a stair that folds up to be concealed behind a ceiling panel. While this is fine for an attic that isn’t living space, you may want something that’s more stable that can hold up to heavy foot traffic. If you plan to rent the space, you will definitely need a more permanent option. There are two categories for your attic conversion stairs: traditional stairs and spiral staircases. A traditional staircase is a traditional home design option. However, it has a very large footprint. This may not be ideal as attics are usually tucked into small spaces in the house. 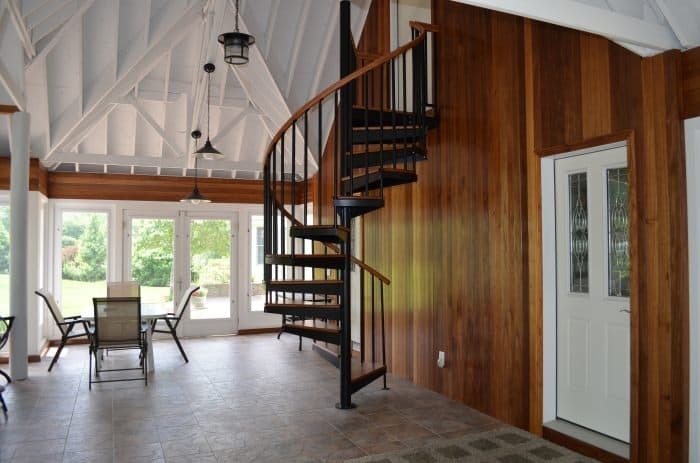 A spiral stair gives you more flexibility when it comes to design and space. Your spiral staircase will have a small footprint that is kept to a circle in your home. Because of its compact design, it can easily be installed in a corner and out of the way. However, the designs are also beautiful enough to become a centerpiece in your home. There are three lines of indoor spiral staircases that each have their own unique characteristics. The first is the Forged Iron Spiral Stair line. Forged Iron is known for its traditional elegance and the ornate details of its balusters and caps create a unique style that is the perfect addition to your traditional home design. The Classic Steel Spiral Stair line includes a versatile design that has the ability to fit into any home design. The clean lines and custom color options make it the perfect fit for both contemporary and traditional homes. The last indoor spiral stair design is the Solid Wood Spiral Stair. This classic design focuses on craftsmanship and the timeless nature of an all wood design. You can find the wood that best matches your home design and finish it to ensure the longevity of your stair. A bedroom conversion is the most common use for a renovated attic. 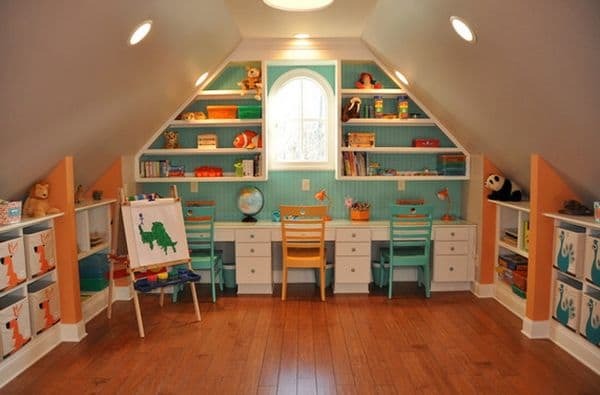 The unique shapes of an attic are perfect for a children’s bedroom. 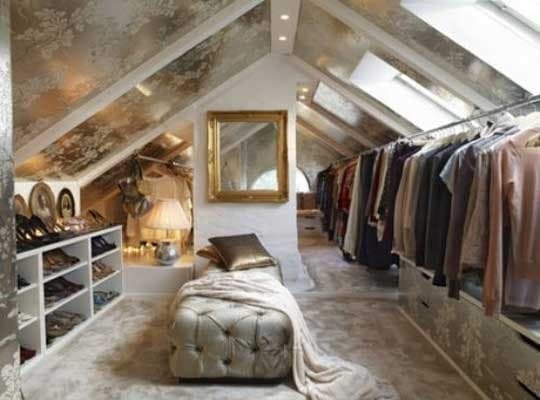 You can decorate in a way that enhances the shape and whimsical nature of an attic bedroom. Children also won’t have as much trouble walking around with a sloped ceiling. 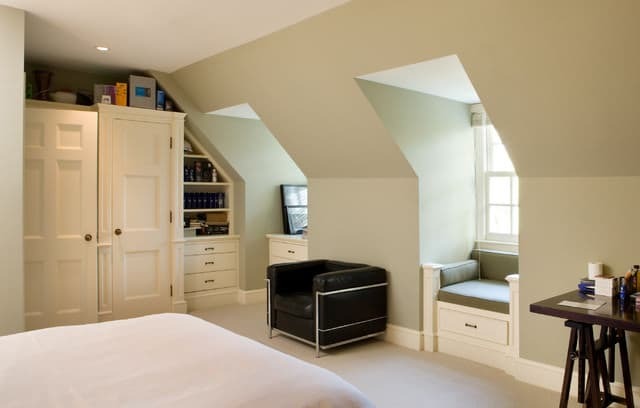 If you’re children are a little older, an attic bedroom is just as ideal for teens. By giving them a room on its own floor, they can have a little more privacy and independence. Add a bathroom to the bedroom conversion for an in-laws suite or the perfect place for guests to stay. If you do plan to add a bathroom, be sure to plan the renovation so that the bathroom is lined up above another bathroom. This makes any plumbing renovations much easier. The beauty of a rec room is that you can make it whatever you want. You can start at the most basic version of a children’s playroom with brightly colored home décor and raise the creativity all the way up to a larger than life playhouse. The slanted ceilings can help you to bring in a whimsical home design with bright colors and interesting pieces of furniture. Promote your child’s creativity with chalkboard walls. Make this extra room their space to use their imagination. If your children are older, you can create a space for them as well. This space has the potential to be an entertainment loft filled with gaming systems and comfortable seating. Many attics are oddly shaped making it hard to renovate them for a conventional use. If you want a more unique home renovation, a home theater may be the design for you. By putting the home theater in the attic, you are giving it its own space without taking away from your normal living room. You can soundproof your attic through insulation and flooring choices to keep any loud movies at bay. Install your surround sound system in the crawlspace behind your knee walls for a real movie theater setting. Installing dimmers for wall sconces allows you to make the most of your space and gives the room a great ambiance. Maximize the space by using casual seating, such as oversized floor cushions. This room is perfect for a family movie night or a kid’s sleepover. Your new room doesn’t have to be used for others. Create a walk-in closet for a luxurious home design. This featured design has wallpapered panels for the ceiling to create an opulent home design that’s fit for any fashion lover. You can install shelving for your shoe collection and an extending railing for your wardrobe. Use large upholstered ottomans for seating and large mirrors to complete your custom closet design. Attic conversions are the perfect solution for homeowners that want additional living space, but don't want the hassle or cost of a full addition to the home. As you can see from the designs listed above, you can use a finished attic for almost anything! Rather than using it for extra storage, don't be afraid to create a unique room that can add value to your home. There are plenty of ways to access your attic, but there is a full list of attic stairs available! If a stylish spiral stair is the right fit for your home, call one of our consultative designers to get pricing in five minutes or less.